“Bog Iron Boys Pitching the Past” 19th Century Baseball Reenactment ~ The History Girl! The Historic Village at Allaire is presenting a new event for the 2014 season! Celebrate the rich history of baseball at their “Bog Iron Boys Pitching the Past” 19th Century Baseball Reenactment! On Saturday, May 17, 2014 from 12:00 noon - 4:00 pm, the Howell Works’ Bog Iron Boys will play the historic Hoboken 9 who have been kind enough to travel to Allaire’s industrial Village for an afternoon game! The game will be played by 1864 rules, with 1800’s vintage costumes and fun! The winner of the first game will play the Elizabeth Resolutes in a second vintage game! 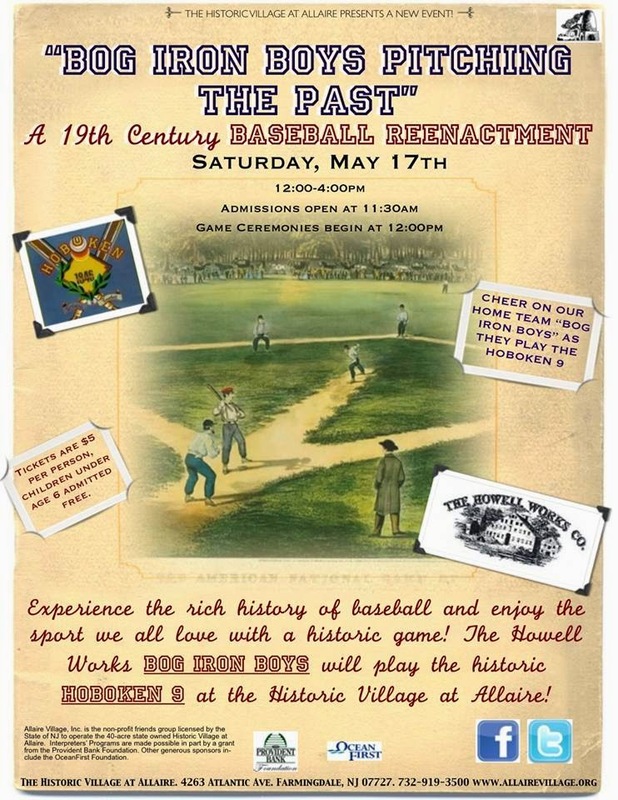 The area surrounding Allaire is filled with baseball history, learn more at this event filled with family fun! Join the Villagers and come cheer on your home team! The events begin at 12:00 noon when the Villagers will call out the players from the Historic Village. The team will lead Villagers to the Show Field, where the games will take place! In addition to the games, activities throughout the day include exhibits of baseball history, craft demonstrations of how bats and baseballs were made, townball and 19th century games for the kids, and more! After the games, walk down to the Historic Village to meet the players! Snacks and refreshments will be available for purchase. Bring lawn chairs and blankets and plan to spend the whole day at Allaire! The Baseball Reenactment is $5 per person and children under age 6 admitted free! Admission opens at 11:30 am and game kicks off shortly after 12:00 noon! Pre-registration is recommended. To register, call 732-919-3500 or visit www.allairevillage.org. The Historic Village at Allaire is located at 4263 Atlantic Ave, in Farmingdale, NJ off Exit 98 of the Garden State Parkway and off Exit 31-B of Interstate 195.